Posted on November 22, 2011, in Health, Parenting, Skepticism and tagged anti-vax, vaccines. Bookmark the permalink. 3 Comments. Hi Christine. There is one correction that I think needs to be made in your post. No vaccine that I know of (or that I or my daughter ever received) is injected right into a vein. Vaccines are injected into muscle. I’ve never even seen animals given intravenous vaccines and I used to give them myself while working for veterinarians. It is sad when people have vaccine reactions (extremely rarely), but right now I feel it is most important for skeptics and the science community to oppose the anti-vax (or the “safe and sane vax”) pseudoscience that’s out there. All of our children are put at risk when people look at the vaccine non-issues illogically. As the CDC states on their information sheets “the safety of vaccines is always being monitored”. Lynn, you are absolutely correct, and I’ve fixed those references – thanks! When I think about it, I knew that, but damn it, “directly into the muscle” is nowhere near as poetic as “directly into the veins.” But accuracy trumps emotional impact. I do think a lot of moms are influenced by anti-vax pseudoscience, even if they don’t believe the autism bunk. And it’s a problem. But my question is how best to counter that, and I don’t think redrafting child abuse laws would be very helpful. In some cases it might be arguable that skipping a vaccine is neglect (if the child lived with someone with Hep B for instance), but I don’t like the idea of broadening the abuse and neglect definitions for this. For one thing, it will just make a lot of people drop medical care for their kids altogether, so no one can report them, or go to quacks who will certify that the kid has a condition precluding vaccination, or encourage people to finagle religious exemptions. For another, I don’t think it’s abuse or neglect. Every time you drive your kid around in a car you are endangering their health far more than you are if you skip the polio vaccine. Indeed a big part of the problem is a public health puzzle – since we’ve done such a brilliant job with vaccines, the likelihood that an individual child will encounter a VPD is very low. So people weigh the risks and decide it’s not worth vaccinating. But if enough individual children skip vaccination, the VPDs will become more common, and the risk of a kid getting it will be much higher. (See pertussis lately.) It’s kind The Tragedy of the Commons – each individual relies on the larger group to preserve something they “own” in common, but each individual wants to be the one person who can benefit without contributing. So the commons gets trashed and everyone suffers. I’ll probably do a post soon about how people view the herd immunity argument. 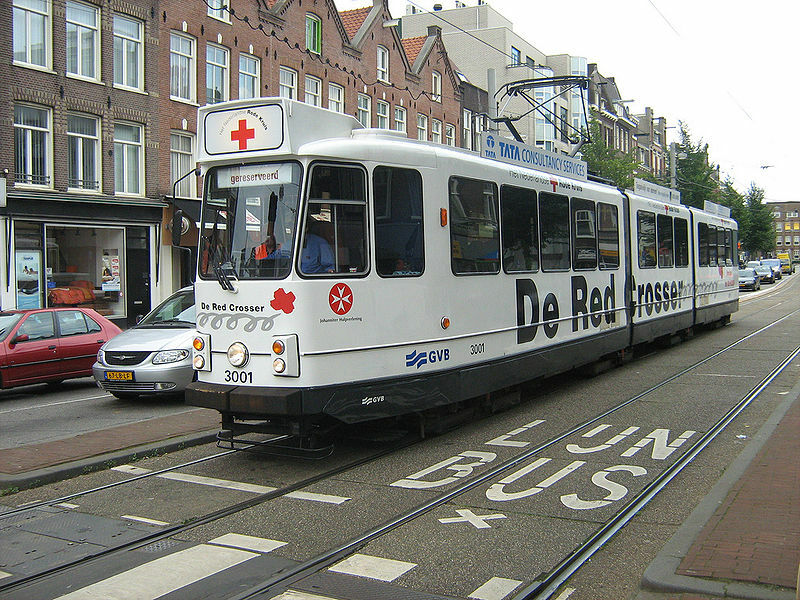 I was somewhat bemused by your choice of the Amsterdam tram by way of illustration (I was born in Amsterdam, and my paternal grandparents lived there, so I’m well familiar with the model), though I guess “medical + trolley” doesn’t yield that many results. The tram in question (in the event you didn’t already know, or if you did, for the benefit of readers) has been refitted to transport physically handicapped people on tours of Amsterdam. I think you’re pretty much spot-on with your evaluation of parents’ thinking, but I think a factor that you perhaps missed is that a lot of people who are becoming parents now were themselves vaccinated during childhood and thus have no first-hand experience of them. My son was born when I was 35, I’m now 41, and I grew up in the Netherlands and the UK, where the MMR vaccine was not approved until the late 1980s. Well, at least I didn’t catch rubella. There’s nothing to dispel the question “well, how bad can an infectious disease really be?” like having actually had it, and I didn’t even suffer lasting damage. My son’s pediatrician says he wishes he could put me in a room with some of the vaccine-averse parents he gets in.